A case was brought in 2016 against Ed Sheeran, his publisher and record label, for allegedly copying Marvin Gaye classic Let's Get It On in his song Thinking Out Loud. Ed Townsend was the co-writer with Marvin Gaye of the 1973 classic Let's Get It On. He died in 2003, and his estate brought an action against Ed Sheeran in 2016 for copying without permission the song Let's Get It On in his song Thinking Out Loud, which was recorded and released in 2014. According to the Digital Music News report in July 2016 the first case failed, as papers were not correctly served on Sheeran and the other 14 defendants, including his publisher Sony/ATV Music Publishing LLC and record labels Sony/ATV Music Publishing LLC, Asylum Records and Atlantic Records, with only two papers having been correctly being served. The judge dismissed that case in November 2016. In July 2017 the Townsend estate again filed legal paperwork in Manhattan. Alongside Sheeran, the defendants are named as Atlantic Records, Sony/ATV Music Publishing LLC and Asylum Records. The Hollywood Reporter stated in June 2018 that a further claim followed from a company called Structured Asset Sales, which claims to own part of Townsend's interest in the song, and sues Sheeran for $100m. Sheeran filed a request to dismiss the lawsuit, but this was rejected on 3 January 2019 by a US District Court judge. As reported in Billboard Judge Stanton stated that there were enough similarities between the two songs to prevent "a judgement of noninfringement as a matter of law". He continues "although the two compositions are not identical, an average lay observer could conclude that parts of [Thinking Out Loud] were appropriated from [Let's Get It On]". US music webzine Spin also quotes the judge as noting that jurors "may be impressed by footage of a Sheeran performance which shows him seamlessly transitioning between [both songs]", and includes a link to that footage. The chord sequence and rhythmic pattern are very similar throughout both songs, featuring a repeating one bar loop of the keys 1, iii, IV, V7. This is what causes them to sound similar. The second and fourth chords of the loop are syncopated, anticipating the next bar by a quaver each time. 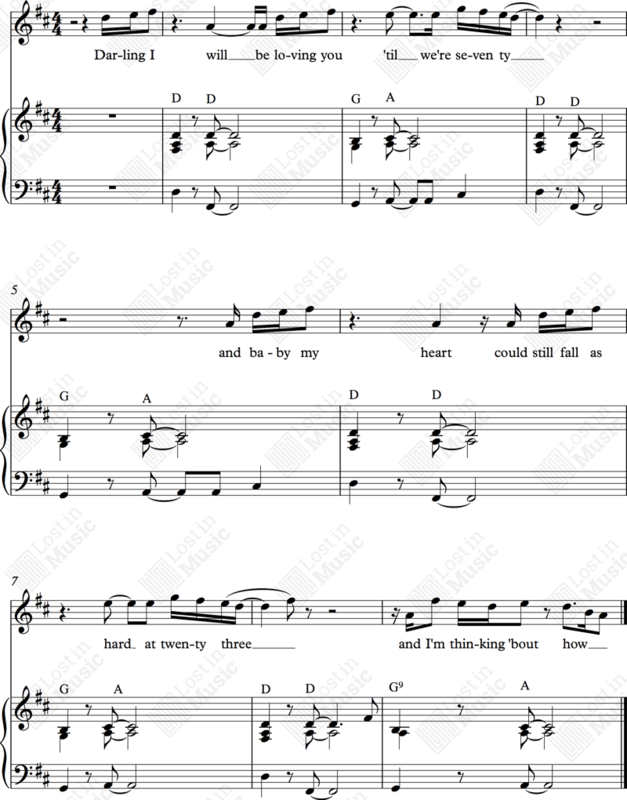 Both songs feature expressions of love in the story, although there is no direct relationship between the lyrics. Let's Get It On is a beautifully laid-back soul track, with warm instrumentation including sax, strings, piano, guitars, and rich harmony backing vocals, underpinned by an ad lib funk bass line and tight drums. By contrast the production on Thinking Out Loud is sparse. Piano, bass and light chorus guitar provide the backing to the solo Sheeran vocal, with light harmony vocals joining in the second verse as the track gradually builds. An electric guitar solo picks up at 3.26. The final chorus, at 3.50, is fuller, with backing choir and Hammond organ. Although the chord patterns in both are very close, there is a subtle but significant difference in the second chord of the loop. Comparing both in the key of D, Gaye moves from D major to F# minor for the second chord (from bottom to top F#, A, C#) - Sheeran from a D major root chord to a first inversion chord of D major (F#, A, D). The songs are in different keys - Sheeran in D major, and Gaye up a semitone in Eb major. The tempo of Thinking Out Loud is slightly slower. They differ structurally. After the first verse (48 seconds in) Sheeran veers off into a 'bridge' of eight bars introducing the new key of E minor. There is a 'coda' figure at 1.37 in Sheeran's song, again taking the music away from the looped chord sequence. 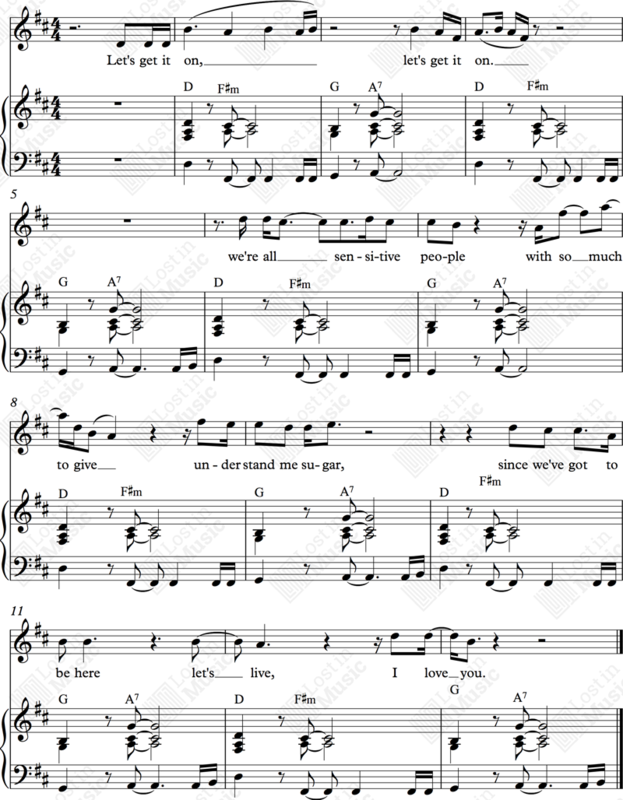 The bridge in Let's Get It On occurrs at 1.34, and the music pauses for two bars on Ab major, the subdominant key. This alternates with the one-bar loop four times over a period of 45 seconds before returning to the loop. Gaye repeats the bridge section at 3.05. Crucially there is no coincidence between either melody or lyrics. The strongest arguments for plagiarism centre around these elements of a song. Ed Townsend's biological daughter Kathy Griffin is not able to sue him because she was adopted by others at birth, and therefore has "no standing in the case" under California law. More detail on this final claim is provided by a Hollywood Reporter article here. Reuters reports the defence arguing that the mood of Thinking Out Loud exhibits "somber, melancholic tones, addressing long lasting romantic love" while Let's Get It On is a "sexual anthem" with positive emotions. (Gaye/Townsend) © EMI Music Publishing Ltd. Recording by Marvin Gaye ℗ 1973 Tamla Records, transposed here down a semitone from Eb major for ease of comparison. (Sheeran/Wadge) © Sony/ATV Music Publishing (UK) Limited, BDI Music Limited. Recording by Ed Sheeran ℗ 2014, Asylum Records. As there is no melody and lyric similarity, the decision must turn on whether the chord sequence and rhythm alone is copyrightable. I don't think a chord progression - particularly one in as standard a time signature and tempo as in this example - can be 'owned' by any one artist. Sheeran's melody and rhythm is completely different to Marvin Gaye's, as is the rest of the song. Similar, yes, but no case for infringement for me.